Home Ask SISTRIX OnPage-Optimisation What is the optimal pagination for sites with a lot of content? What is the optimal pagination for sites with a lot of content? Google has published concrete recommendations on how to deal with the pagination of websites, which efficiently solve the classic problems that spring up when you are splitting page-content over multiple pages. Google indexes each component-page (at first without even knowing each connection). Because of this, it cannot be guaranteed that the user will be shown the best/most fitting page in the search results (for example the first page of a product category). Google will collect and evaluate ranking factors for each of these component-pages. Each page therefore ranks for itself (again without context). For this, it would be an advantage if we could create a connection between the many single pages and use that connection to strengthen a specific page (usually the first). Google has introduced two optimal approaches to avoid these classic SEO problems and you should definitely use one of them. What do approach #1 and #2 have in common? A View-All page combines all of the information of the paginated pages onto a single one (overview page). All of the information is thereby combined on a single page. For example, if you have a category with five component-pages, each with six products, the View-All page would contain thirty products for the corresponding category. The approach of a View-All page should only be taken into consideration if the entire View-All page can be delivered as quickly as possible – in under five seconds, for example. Furthermore, you should check whether this page is actually helpful to the user when you display your products or information is such a way. 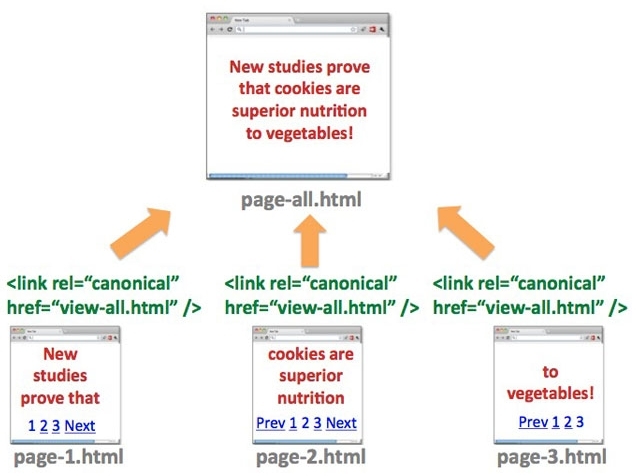 Another possible approach to solving the SEO problems that show up due to pagination is to use the link-attributes rel=”next” and rel=”prev”. For this, the link-attribute has to be part of every pagination link on the component-page. This means that every link to a paginated page, like “back” or “more” as well as “page 2” and “page 4″, has to use rel=”next” or rel=”prev”, respectively. If we are on the third component-page (/page/3/), the link to the previous page (/page/2/) would use the attribute rel=”prev” and the link to the next page (/page/4/) would use rel=”next”. 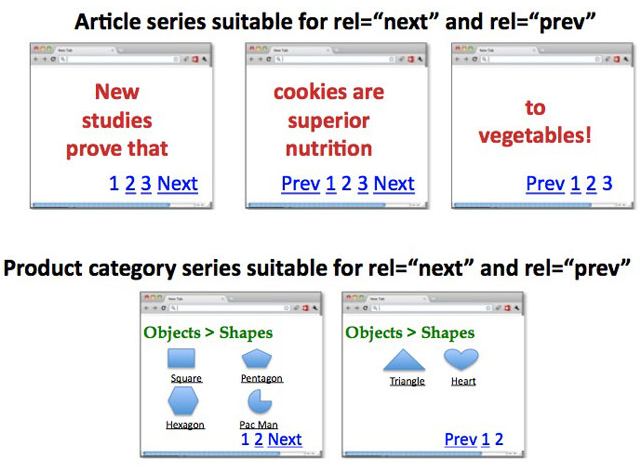 You naturally do not need the rel=”prev” on the first component-page, nor rel=”next” on the last. Both approaches let Google know exactly how the paginated pages belong together. Due to this, Google is able to better crawl the content, or rather connect it more easily with each other and thereby show the content-page that is most relevant to the user in the search results – which is often times the first page (or the View-All page) of the paginated content. From a user’s point of view, it is advisable to use so-called talking URLs if at all possible (for example www.mydomain.com/page/1/) and entirely avoid the GET parameter in the URL (for example www.mydomain.de/page.html?Page=1&ID=). Additionally, you should absolutely keep from using “continue” and “back”. Instead offer the user “page 1, 2, 3 … 99” as a paginated navigation. “Logarithmic pagination” means that you will group numbers in counts of ten, hundreds and so on, when there is a large number of paginated pages. The goal of this is to enable the user to reach each page of the paginated content as quickly as possible.